--the five teens that attended this program had a great time experimenting with glow-in-the dark stuff and seeing which projects worked and which ones were less than impressive. --I regret to report that I forgot to bring my good camera and was therefore completely incapable of photographing most of our finished projects properly, so I'll just include links to the instructions and a few photos and notes as I can provide them. 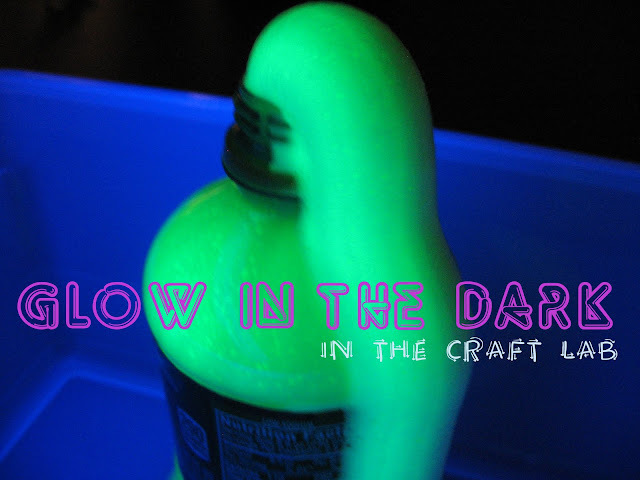 --the first picture in this post is of glowing "elephant toothpaste." although this project calls for hydrogen peroxide which comes plastered with dire warnings about its toxicity, this was probably our most successful project all day. We used "glow water" instead of paint and it worked great! Maybe I'll try some of these projects with toddlers this fall?